With the summer holidays looming are you scratching your head for somewhere new offering tasty lunch for kids in Worthing? Our fantastic seafront gives plenty of opportunity to chill out looking in the pools left by the outgoing tide, or a walk along the pier, or even better a bike ride all along the prom. What better way to finish your activities than with a lovely lunch on our seafront terrace where the kids are catered for with delicious food, colouring packs and a friendly welcome? The Dome Cinema, just next door, offers great prices for movies both at the weekend and during the week, with special offers on Saturday and Sunday mornings and on Mondays. With great sequels of The Incredibles and Hotel Transylvania to look forward to, its a sure winner during the 6 week break. 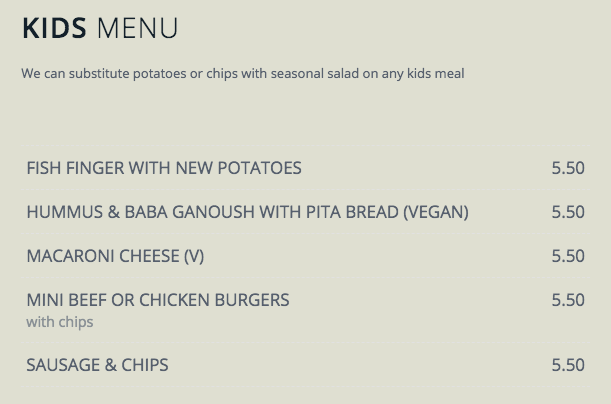 Our children’s menu has plenty of delicious lunch for kids in Worthing.